Our best-selling recycled sail bag. And, now we've made it even bigger! This versatile bag fits 5 full rolled beach towels with room left for your sunscreen, wallet, water, and phone. 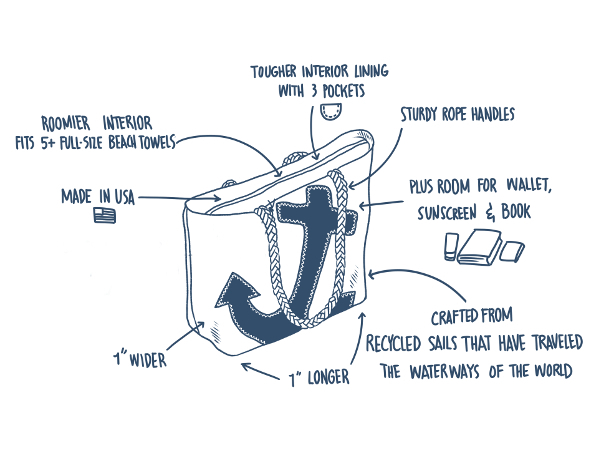 Handcrafted from sails that have traveled the waterways of the world, it's the most unique beach bag you'll ever own. The original markings and characteristics of the sails are maintained for authenticity. Water-resistant, durable rust-free zippered top, with a full interior lining. It features sturdy rope handles using the same 1/2" 8-strand rope used for anchor, buoy, and mooring lines. The 3 interior pockets help keep you organized, plus the sand just falls right off of it. Use it every day - it doubles as a fun gym bag, book bag, and all around everyday tote. Each tote measures approximately 19" wide x 13" tall. New styling adds an extra inch from seam to top, meaning you can fit more than ever. This classic bag is perfect for the beach, travel, shopping, or around town. Also available in Large. SHOP ALL RECYCLED SAIL BAGS. Machine washable, dry flat. Handcrafted in the USA.